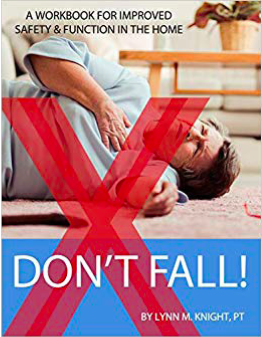 According to the Centers for Disease Control and Prevention, three million older people are treated in emergency departments, each year, for fall injuries. The continuing dispute regarding these statistics is that, of these people, many of them don’t inquire about fall preventatives until they are visiting recommended physical therapy post-accident. For 31 years Lynn Knight has treated multiple patients for extensive fall injuries. As a Physical Therapist for Meridian home care for 16 years, and previously at Jersey Shore for 15, she has educated people on the topic time and time again, until she decided she should implement her knowledge into a more pragmatic entity. In 2018, Lynn Knight decided to take her thought into action. She wrote Don’t Fall, which is a workbook that practices a methodical way to adult proof your home. The book travels into a house and identifies safety hazards and fall poten- tials. There is an organized checklist for every room to assist in making your environment safer and more accessible. In an interview, Knight conveyed her concern and devotion to this topic. An accident involves more than just the per- son who falls, family members and care-givers are also affected. Those who are close to the patient are obligated to make life changes in order accommodate the additional care that an individual may need. As we age, our bodies experience certain limitations. Many people have difficulties adapting to these constraints and accepting the fact that they are unable to maneuver the way they once could. The refusal to swallow your pride is a burden, which results in the avoidance of discussing fall preventatives. The glory of this book is that you can order it right online from either Amazon or www.dont-fall.com. Knight encourages individuals to become proactive and to make changes in your home. That said, she provides significant resources and information to keep her audience safe in easy to understand, everyday terms.